Mood board: The invitation for Junya Watanabe’s A/W 2016 show didn’t give much away. He’s a designer known more for what he does than what he says, which is something of a luxury in the neoteric, hyper-connected bubble that fashion week seems to exist within. 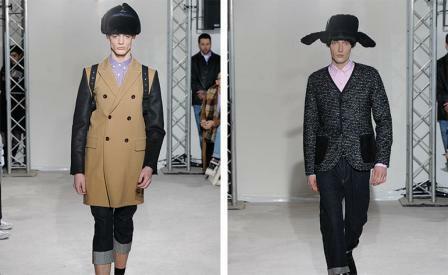 At first sight the clothes he presented for next season appeared relatively conservative, but upon closer inspection Watanabe rendered the well-worn archetypes of men’s tailoring in spongy, coated, modern fabrics. Best in show: A series of neat patchwork shirts with modernist motherboard appliquéd fronts will be a common sight at the next round of seasonal shows. They also conformed to Watanabe’s ‘techno couture’ métier. Finishing touches: A group of long, single and double breasted wool coats with rectangular solar panels stitched onto their backs prompted guesswork about the theme of the show. Watanabe’s maxim might have been more practical than philosophical for winter. Case in point: a discreet black wire trailed from the panels over the left shoulder, slipping neatly into a curiously iPhone shaped pocket.